Air conditioning unit with low electrical consumption, maintenance-free compressors, maintaining an appropriate temperature for driving during the day and sleeping during the night, making the rest period more comfortable and refreshing. Its versatility means the unit can be adapted to the requirements of the customer and to the space in the cabin, distributing the components as is convenient. Uses: trucks, public works machines, electrical vehicles, mobile homes and caravans. 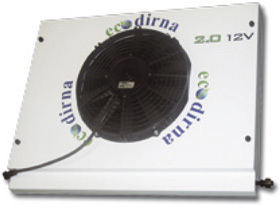 Units available in 2000 W (12V) and 3000 W (24V). Split is a range of air conditioning units for daytime and night-time use, making the cabin temperature more comfortable. with the requirements of the customer and the space available; the installer can therefore fit each unit in the most suitable place. The Split units are powered directly from the vehicle battery. By preventing atmospheric emissions of CO², the units of the Split Line range are the perfect ally for the environment and are compatible with the requirements of the North American Environmental Protection Agency (EPA) and with EU regulations on anti-idling in haulage vehicles (parking coolers). The unit increases road safety by allowing proper rest and sleep through the use of air conditioning in the cabin without the engine running. Fuel cost savings are achieved when using the unit overnight, since the engine does not need to be idling, thus allowing proper rest or sleep inside the cabin of the vehicle during the summer months.